Revised data on metro area unemployment rates in 2018 will not be complete until April 19, but today the Bureau of Labor Statistics released current unemployment statistics for February 2019. Seasonally adjusted estimates for January and February show metro area unemployment rates mostly unchanged. 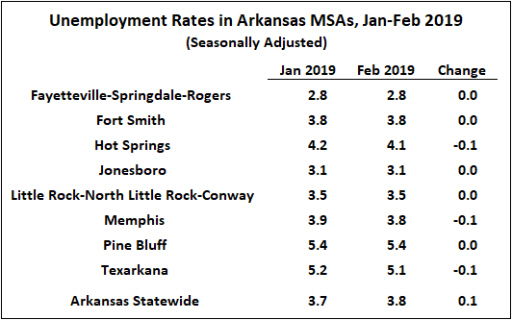 In contrast to a up-tick of 0.1 percentage point statewide, unemployment rates ticked down in Hot Springs, Memphis and Texarkana. 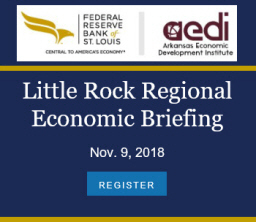 The metro areas in the state’s northern tier continue to run below the statewide average of 3.8%, with Fayetteville at 2.8% and Jonesboro at 3.1%. Unemployment rates in Pine Bluff and Texarkana remain above 5%. Compared to February 2018, the latest estimates show mixed changes over the past year. Unemployment rates have declined slightly in Fort Smith, Hot Springs, Jonesboro and Memphis. On the other hand, unemployment increased by 0.4% in both Pine Bluff and Texarkana. 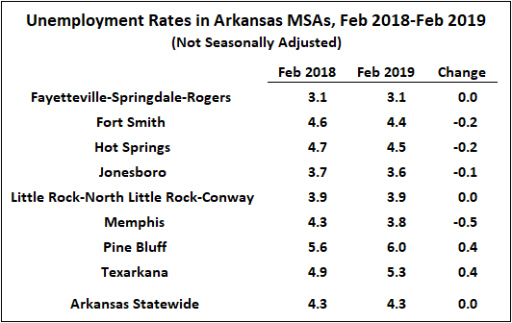 Nonfarm payroll employment was higher than a month earlier in five of eight metro areas in Arkansas, but was down in Pine Bluff, Hot Springs and Memphis. 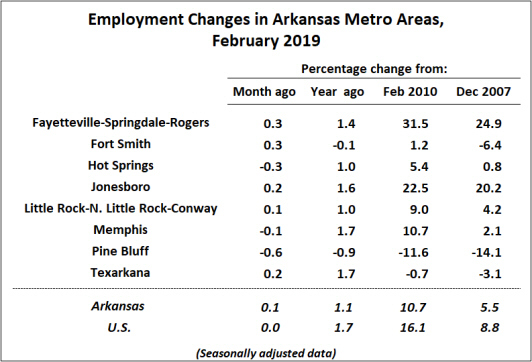 Compared to a year earlier, employment increased by 1.0% or more in all but two of Arkansas metros. Pine Bluff was down 0.9% while Fort Smith was essentially unchanged.